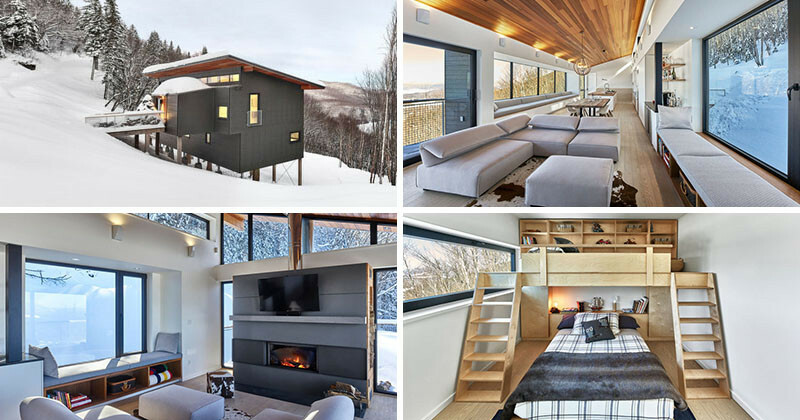 Sophie Robitaille and Andrew Curtis of robitaille.curtis, have designed a weekend ski chalet in Lac Archambault, Quebec, for a family with school age children. 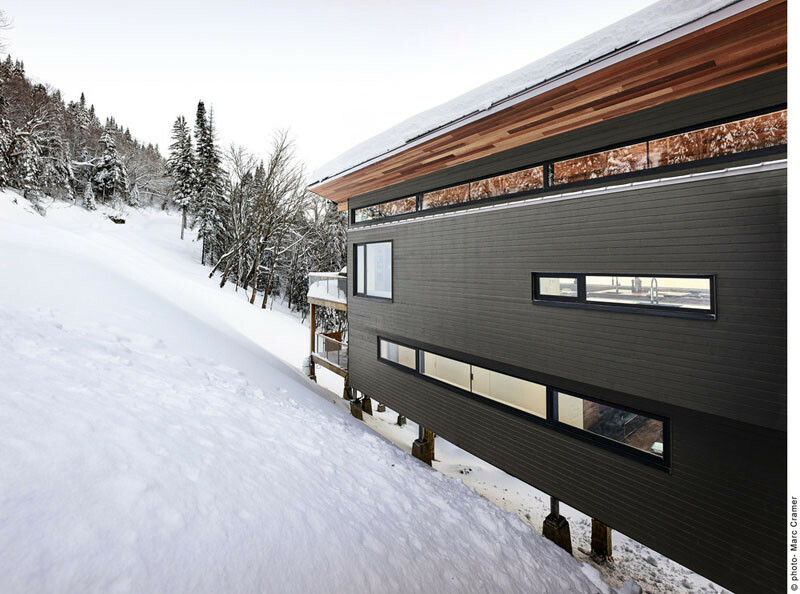 The chalet is located at an elevation of 2,435 feet, on a steep slope, surrounded by a forest of spruce, maple, beech and birch trees. 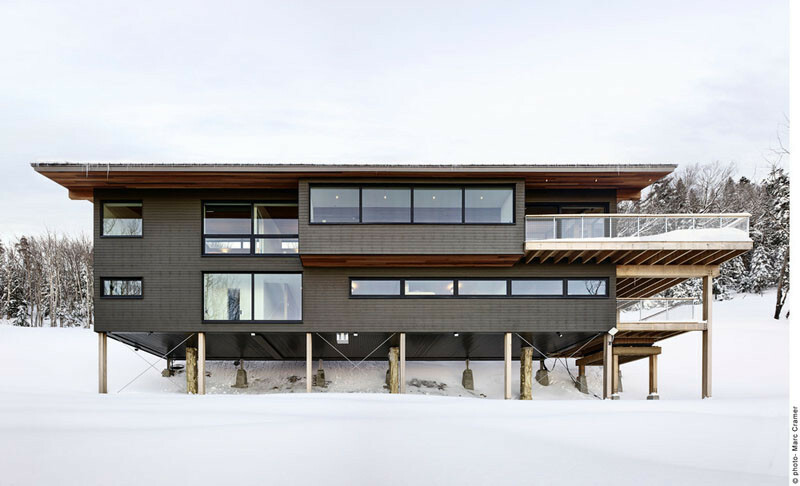 The chalet is elevated to allow snow and spring run-off to flow freely underneath the structure. In the warmer months, a small forest of ferns and moss grow in the space. 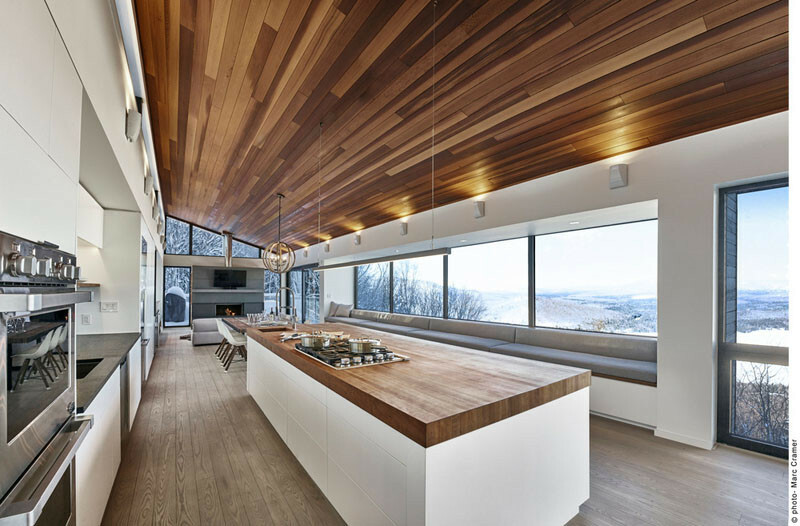 Inside the chalet, the floor plan has been kept open, with western red cedar covering the ceiling. 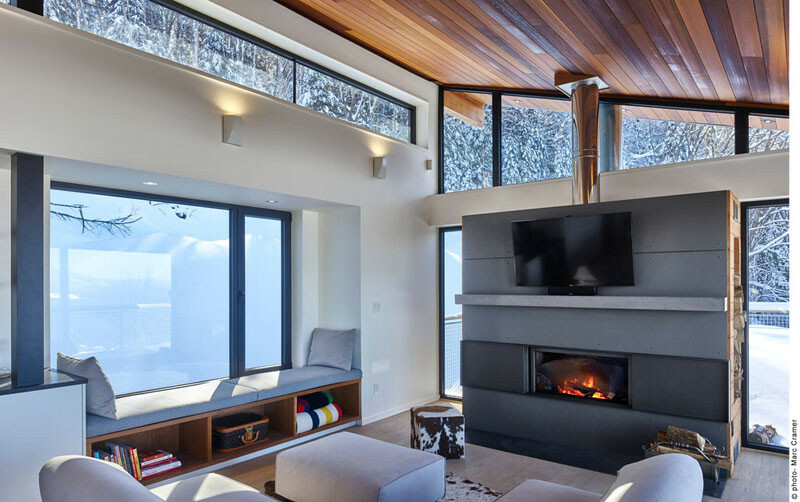 At one end, there is the living room, that has windows on three sides, a fireplace, and a cozy window seat with mountain views. Spanning the length of the kitchen and dining areas, is a 27-foot-long bay window and window seat, with extra storage hidden underneath. 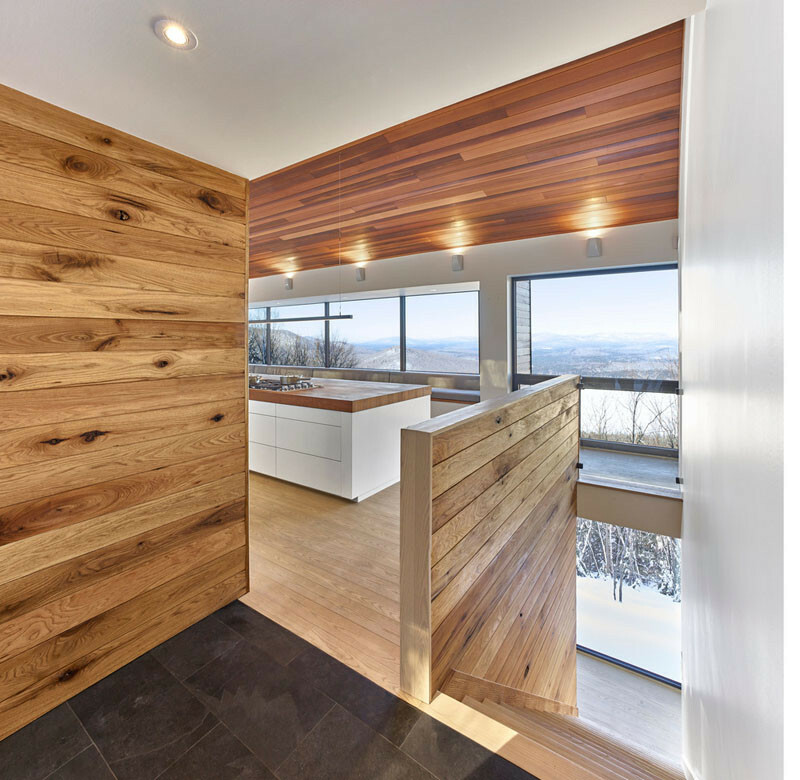 The kitchen is home to a large central island that includes a cooktop and prep sink, allowing the host to not have to turn their back to the views or the family and friends as they are entertaining. 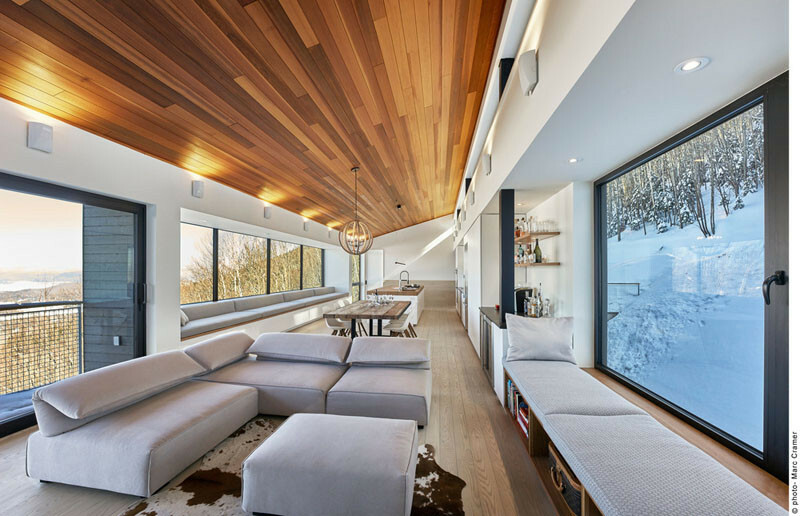 The dramatic panoramic window wall perfectly frames the amazing view. 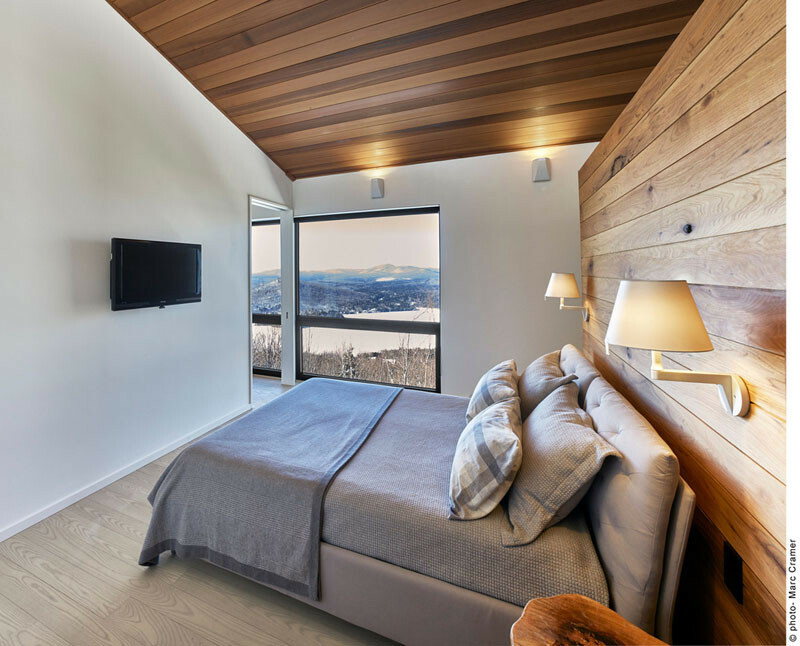 At the end of the main living level, is the master bedroom, that is also home to windows that provide even more views of the surrounding area. 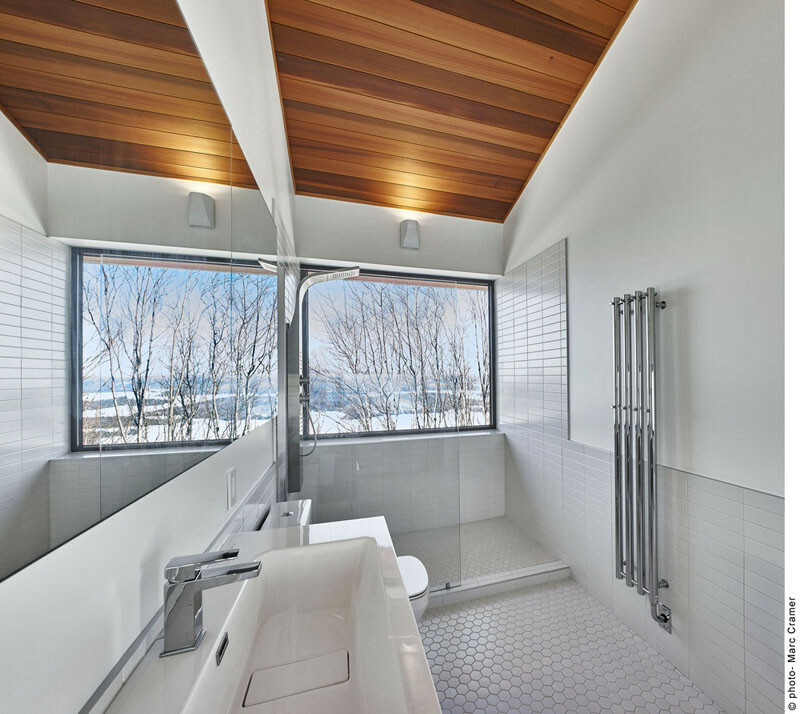 The master bathroom is bright and airy with its high ceilings and white walls. On the lower level of the home are the children’s bedrooms. 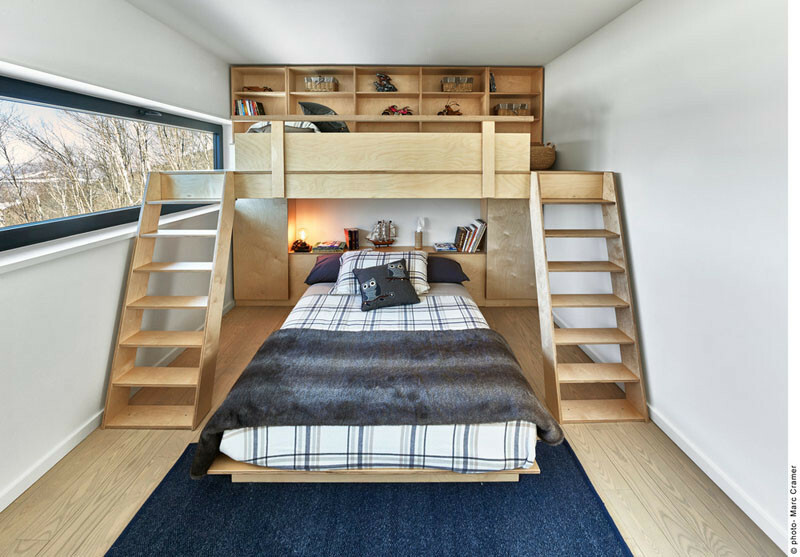 This children’s room has a custom designed bunk bed, that perfectly fits the room. 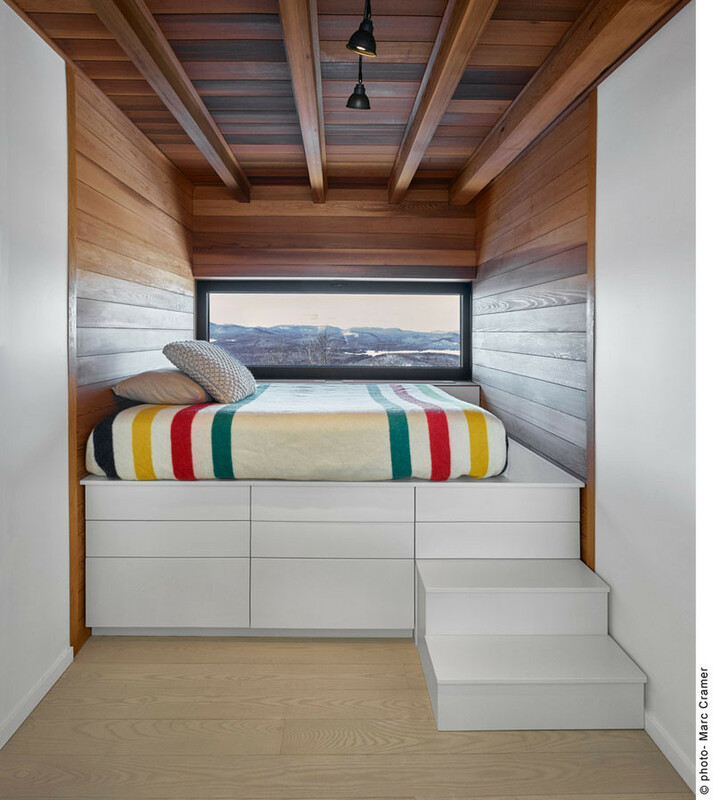 In the other children’s bedroom, a cozy built-in bed sits above built-in drawers, and is flush with the full-width window. 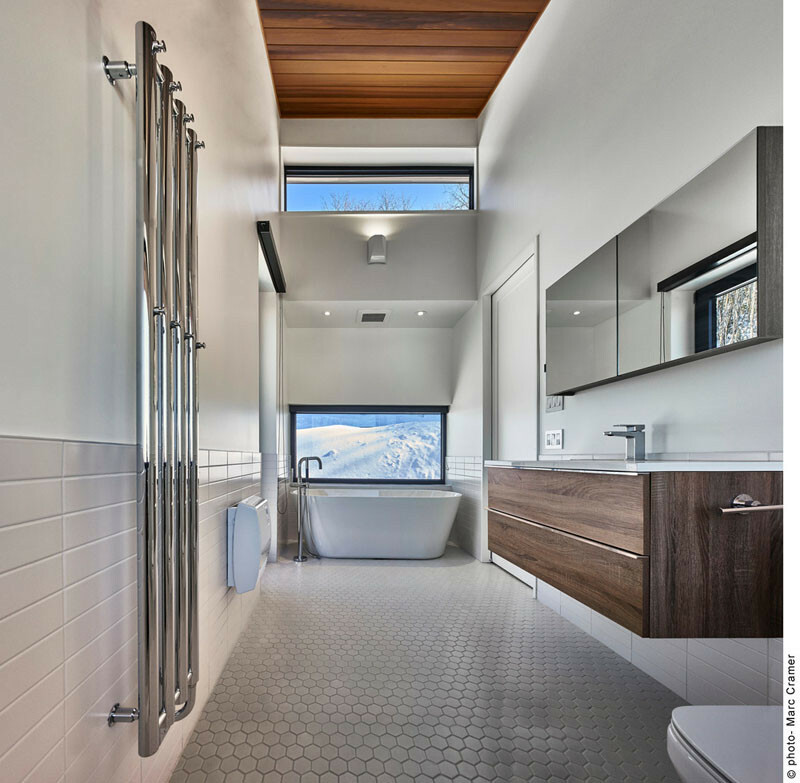 There is also another bathroom on this level, that has a large window to look out while you shower.